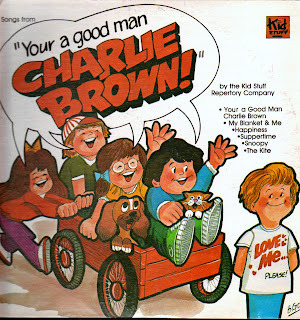 I have found yet another version of the "You're a Good Man, Charlie Brown" album, this one from the infamous Kid Stuff Repertory Company. These are the same people who did the two kiddie disco albums I recently had on the blog. There is one problem with this album right off the bat, which you'll notice if you look at the album cover above. The actual title of this album is "Songs from Your a Good Man Charlie Brown". That's right, they couldn't even spell the name of the show correctly! And they had a number of shots to get it right: The title on the front cover, the song list on the cover, the title on the spine of the album, even the label on the record itself get it wrong! And the interpretations for the songs are all screwy. For instance, the title song, which should be this loud fun boisterous tune has been turned into a slow ballad like the poor guy died or something! And "Happiness", which should be a slow song, is done uptempo. The intro to "The Kite", with its heavy synthesizer, makes it sound like it should be the theme to a news show. "Suppertime" sounds like the music is done by Miami Sound Machine. "Snoopy" is OK, except the beginning and end, which are supposed be slow and wistful are fast, and the middle part (the "fierce jungle animal" part) is slow. And finally, if you've ever wanted to hear Linus's song "My Blanket and Me" done in the style of a '70s cop show theme, you now have your wish. When I listened to this, I spent half the time laughing and half the time shaking my head in disbelief. This is, to my knowledge, the strangest version of this music I've ever heard. There is a sort of morbid fascination here, like trying not to stare at a car accident but not being able to help yourself. And one more thing. Take a good look at the kid I guess was supposed to represent Charlie Brown on the cover. How do you like that t-shirt? Half of me think that that's the most pathetic thing I've ever seen, and the other half thinks I should go to CafePress and declare it the first official Way Out Junk t-shirt design!! I agree with you that the tee shirt is "the most pathetic thing I've ever seen". It is just sad - I don't know if they ment it that way or not. I got another LP with this same story title from Mr. Pickwick records. What the hell kind of cover album from this show doesn't contain the best song, "Just One Person"?!?! Actually, "Just One Person" isn't from YAGMCB. It's from its follow-up, "Snoopy the Musical" (not by the same composers). "Just One Person" was clearly meant to be this show's answer to "Happiness", since it was the show's finale. Some productions of YAGMCB tend to throw in this and other songs from "Snoopy". Also, "Just One Person" has sort of become a de facto Muppet anthem...the man who wrote "Snoopy" was also one of the musical directors for The Muppet Show, and the song showed up there. This is the funniest thing I've heard in quite a while! Thank you!